Making a gingerbread house isn’t as difficult as it might seem. Ten-year-old Daniel, under the watchful eye of his Mum, Yolanda, whipped one up for a school project. 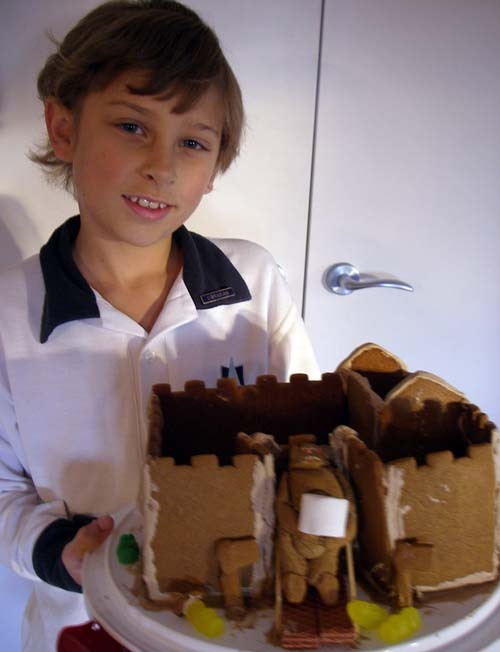 Here’s a quick and easy gingerbread recipe that our family has used for many years to make both gingerbread biscuits and gingerbread houses – and now, a gingerbread Medieval castle. 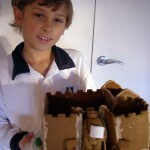 Daniel made his own edible castle for a school project. Daniel’s Medieval gingerbread castle. Click to enlarge. To make a gingerbread castle, double the above recipe. We also added standard cocoa powder to make it brown. For your little girl, you could use pink icing and create a fairy or princess castle instead. 1. Gently melt syrup, sugar, water and spices in a large saucepan. Bring to boil and stir continuously for 2 minutes or until sugar has dissolved. 2. Remove from heat and add the butter. Allow butter to melt and mix through the mixture, then add the baking soda. Stir briskly. You should notice the mixture changing colour as it reacts to the baking soda. 3. Add enough flour to make a firm dough. Set aside to cool. You can wrap the dough in clingfilm and leave it in the fridge to use at a later time if you wish. 4. When you are ready to make the biscuits or gingerbread house, pre-heat the oven to 180 degrees C (350 degrees F). Line baking trays with baking paper. 5. Roll out dough to around 5cm (2 inches) thick. Biscuits can be made thinner. If making a structure such as a gingerbread house or castle, it’s best to keep it to this thickness. 6. Using cookie cutters or a template (download our template for a castle), cut out the dough and place on baking trays. Remember, the dough will rise slightly so do not place items too close together. Bake for 10-12 minutes or until golden brown. 7. When the gingerbread is done, wait a minute or two before transferring it to a wire rack to cool. 8. To make a house or castle, use royal icing to ‘glue’ the pieces together. Then decorate with icing and lollies – a great activity to do with the kids! Lightly whisk egg white, then slowly add icing sugar. Add colour of choice when mixture is completely combined.